There are two ways to photograph a mountain. One way is to try and capture its changing moods. This usually involves wider angle shots that encompass the mountain’s surroundings; dramatic light and weather are often part of the image. The other is trying to capture a mountain’s character. But what do I mean by character? 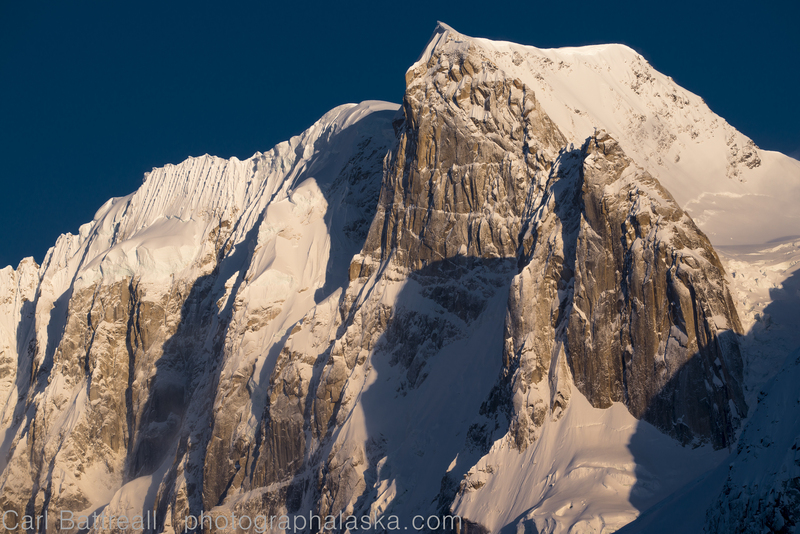 In simple terms, I mean photographing a mountain in a way that reveals the mountain’s “structure”. Is it smooth and featureless? Or blocky and fractured? 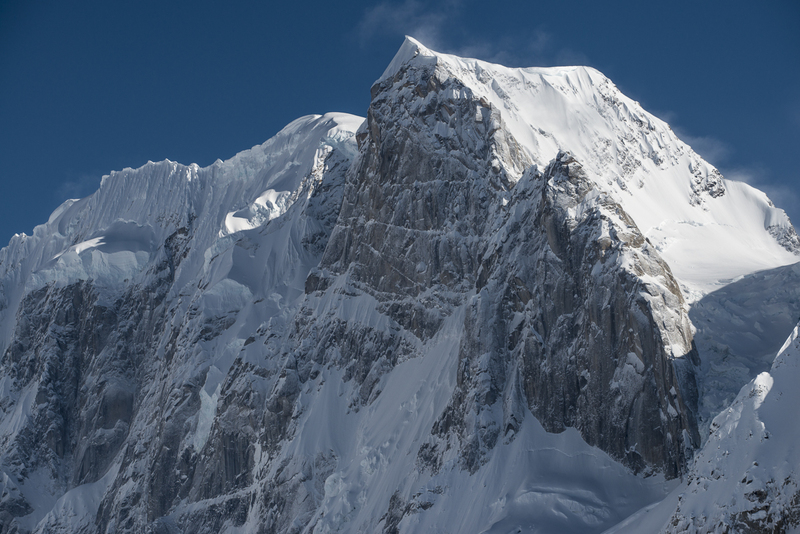 Is a mountain a series of ridges or hanging glaciers? Or is it a single sheer wall, that rises from the ground to sky without interruption? When capturing a mountain’s many moods, we usually photograph during that magic light of early morning or late evening and sometimes during storms when the mountain is barely visible. But to reveal a mountain’s character, we must spend a day observing the light as it travels across the mountain, waiting for that time when all of the mountain’s secrets are revealed. Some photographers find this to be boring, preferring the drama of capturing a mountain’s mood over its character, which can often be during the middle of a bright, sunny day. Obviously, the time of the year and the angle of the sun plays a role, along with the aspect of the mountain your photographing. Often, especially with big mountains, the light never reveals a mountain’s secrets, they hide in the shadows (cold and in the shadows is one of a mountain’s many moods). Below is an example of trying to capture a mountain’s character. The mountain is Thunder Mountain in Denali National Park and Preserve. 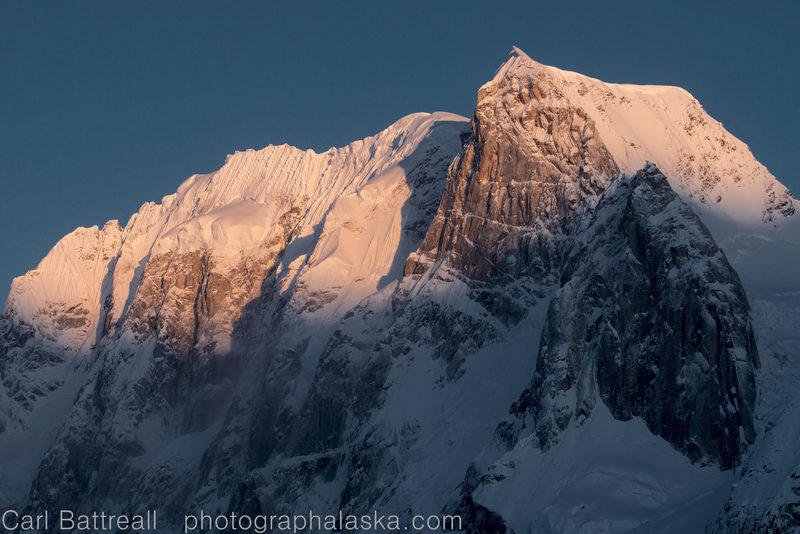 The light is not illuminating the face, creating a cold, moody image, but not capturing the mountain’s character. The light is at an angle that reveals the mountain’s fractured surface and highlights the warm color of the rock. The sun is low and directly facing the mountain. It is a dramatic look, especially with the dark blue sky. There is some nice texture, but some features of the mountain (like the fluted ridge) are lost due to the direct, flat light. The color of the ice and mountain is less obvious. 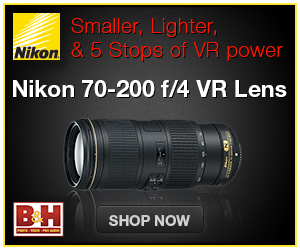 This is the type of light most photographers are after. It doesn’t really work on such a tight shot of the mountain. A wider angle image with an interesting foreground might have worked well with this light, which could have been a nice moody shot, but not a great one for revealing character. Which is your favorite? I prefer the second one. It does the best job a revealing the mountain’s unique texture and form. Many people prefer the more colorful images but that is not necessarily the best way to share a mountain with people. It is true that I have a climbing background and that this way of looking at a mountain and trying to discover its character is influenced by a mountaineer’s perspective, who is always looking for lines in the mountain’s surface. Even so, I still think if you can reveal a mountains secrets, even non-climbers will fall under the mountain’s magical spell, which is a spell most people enjoy being under. 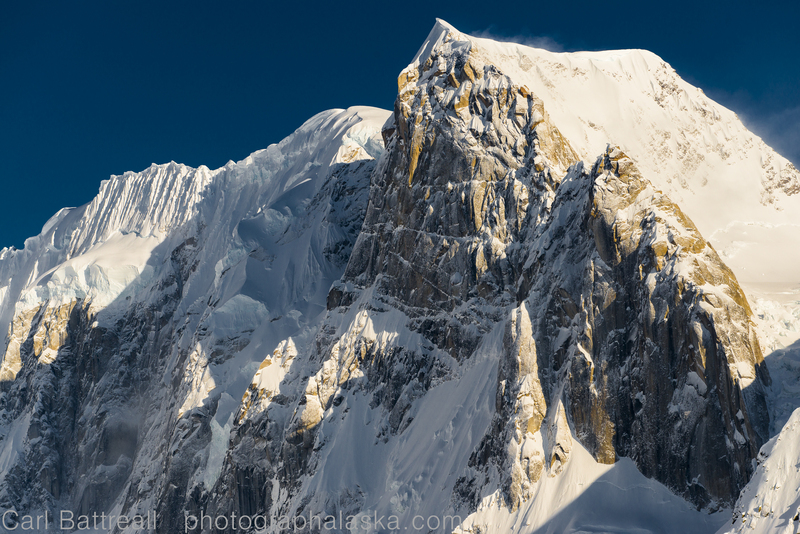 This entry was posted in New Photos, Outdoor Skills, Photography Skills and tagged Alaska, alaska Mountains, alaska photographs, alaska photography, alaska range project, mountain character, mountain moods, mountain photography, nikon d800e, photography techniques, Thunder Mountain, Wilderness photography by Carl. Bookmark the permalink. Excellent post, thanks! Beautiful mountains!